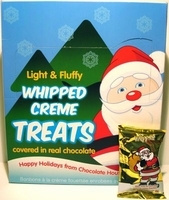 A whipped creme shaped Santa covered in a rich milk Chocolate. Each Santa is wrapped in a festive foils making him hard to resist. These are made by Chocolate house the makers of fine chocolates. If you love the whippe creme candies we also have them in the shape of snowman. For those who like mint check out the chocolate mint christmas trees. Each box has 24 individually wrappe treats.